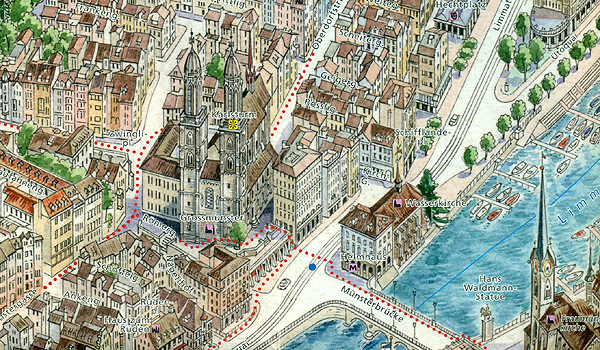 Zurich on a beautifully hand-drawn panorama map from Gecko Maps offering a 3-D bird's-eye view of the city, with on the reverse a more detailed enlargement of its historic centre. Every building is drawn to scale with full architectural details. Drawn by the renowned artist Ruben Atoyan who specializes in this kind of mapping, this title presents on one side a view of the city looking south-east, with the mountains across Lake Zurich framing the top of the map. Coverage to the west extends to the Sihl and a panel at the bottom presents a selection of the city’s best know buildings, including the central railway station, the town hall, university buildings and several churches. On the reverse the city’s historic centre is presented in greater detail, highlighting recommended sightseeing routes to view its most interesting buildings.